Other company names: ARISTE CALAME, MONTRES ZODIAC, ARISTE CALAME FILS, MANUFACTURE D’HORLOGERIE "ZODIAC-CALAME CO.; ZODIAC WATCH CO.; New York, ZODIAC WATCH AGENCY, New York, ZODIAC WATCH CO.; ZODIAC, CALAME & CO.
June 1944, Vol 36/3, p295 (Browman) Ehrhardt, Sherry, and Peter Planes, Vintage European and American Wrist Watch Price Guide, Heart of American Press, Kansas City MO, 1984 (Ehrhardt & Planes). Fried, Henry, Letter, Horological Times, June 1984, p.331 (Fried). Quick Fit Swiss Material Systems, E. James Renz, New York, 1952 (Quick Fit). History: Bowman said that Ariste Calame (1839-1917) first set up a workshop in 1864 in Cret-Vaillant The watch company was founded in 1882 by Ariste Calame. The original name of the company was Ariste Calame. It was a small workshop. A 1990 as said the began to specialize in sports watches. The name "Zodiac" was used early but was not registered until 1908. The founder’s son, Louis Ariste Calame, was sent to watchmaking school and then began to participate in the business in 1895. Under his direction the business Calame, took over the business that year. Members of the family given Bourdin are shown below. Bowman said that the company gave up being a subcontractor for FAVREPERRET and became an exporter. In 1908-1911 it made its own calibers and employed about 50. 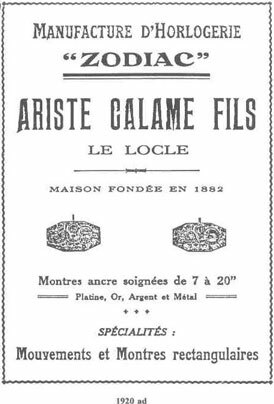 The company was listed in 1920 as Ariste Calame fils (the first Ariste Calame had died in 1917.) See ad below . In 1923 it was listed as Ariste Calame: Montres Zodiac, with wrist watches for men and pocket watches, plus an ad. ZODIAC was imported in 1924 by the Eisenstadt Mfg. CO., St. Louis, MO. Rene Calame, grandson of the founder joined the company and made commercial and technical changes. His father, the younger Ariste Calame, became one of the founder Presidents of the Federation Horlogere. Bowman said the Zodiac-Sport was introduced; it was a 10 ½ ligne hermetic watch, not a table clock, in a leather-covered case, that could be opened and closed with one hand. The company was listed in 1933-1935 in Le Locle and Geneva. The listings were accompanied by pictures of wrist watches labeled "unbreakable." The Grace model was listed in 1940 and 1966. The company exhibited at Basle in 1949 with the Datagraphic, a 12-ligne calendar with the moon phases, and the Autographic self-wind with visible power reserve indicator. A 1949 ad from the Zodiac Watch Agency, New York, for the Autographic called it a "new self-winding watch with a power reserve gauge." Fischer discussed this watch that year and so did SHJ in January, 1950. (See Up Down) The company exhibited again at Basle in 1950. An ad in 1950 was again for the self-winding. Autographic with up-and-down indicator. During the last year of his life the son, Ariste Calame, organized and set up a new factory building in Le Locle which was opened in 1951. The company was listed in 1951. Zodiac was listed by Quick Fit in 1952 as an American import using movements by ETA, A. SCHILD, LIENGME, and FONT. A 1953 ad was for the Autographic, "famous for Reserve Power Gauge, amazing rotor action, automatic." A 1955 ad from the ZODIAC WATCH AGENCY, New York ( a division of Edward Trauner Inc.) said " The world’s most modern watch," referring to the ZODIAC Autographic, which sold for 71.50 in a stainless case, 89.50 in a gold-filled case. It was a self-wind with a power reserve power gauge, 17 jewels, water and shock resistant, anti-magnetic, unbreakable crystal, radium dial, with a sweep seconds. It was the official watch of the Swiss Federal Railways. ZODIAC was imported to the UK in 1959 by E.A. Combs, London, and again in 1963 by E.A. Combos Clocks Ltd.
A 1966 ad in the Los Angeles Times was for the Barrister wrist, Cal. 1305, in 14K gold, for $200. The company was listed in 1966 as ZODIAC SA. The company exhibited at Basle in 1972 with a wrist watch with a dial of the same gold texture as the bracelet. There was a two-page ad in Modern Jeweler, October 1972, for ZODIAC, illustrating the SST Astographic which had no hands; instead, two revolving satellites and a red moon indicated the time. SST meant "Split Second Timing. The watch was an automatic and calendar, shock and water-resist. The ad said "Americans best selling underwater watch…..Astographic introduced one year ago….no hands styling….talking display box." This watch was imported to the US in 1972 by Edward Trauner Inc. "largest importer of chronographs." There was an ad in 1973 for the SST Astographic. The company was listed in 1973 with a battery-operated watch and Tidy. In 1974 AH&J illustrated ZODIAC’s new diving watch, the Super Sea Wolf, pressurized to 2500 feet, with a bezel for elapsed time read-outs. In 1974 the company also introduced an LCD and new models, slim wrist watches in yellow gold, the man’s a self wind. The company was listed in 1975 with Rotomatic and six new calibers. In 1979 MONTRES ZODIAC SA was listed as part of the GROUPE DIXIMECHANIQUE . Fried said in 1984 that ZODIAC-CALAME CO. owned the Guardsman label making Time Recorders, and that movements for them were made by the RECTA WATCH CO. In 1990 the address of the ZODIAC-CALAME COMPANY was care of PAUL BUHRE in Le Locle but the ZODIAC WATCH COMPANY was still in New York. In the 1990’s ZODIAC watches were being produced by ZODIAC SA in Neuchatel. A watch was placed in the Arthur Collection at the NAWCC Museum marked "Ariste Calame." Erhardt & Planes showed six Clebar wrist watches, all from ca 1957: five chronographs with radium silvered dials, subsidiary seconds, 17 jewels, in round stainless steel cases, one with 30 minute and 12 hour recorded, two waterproof, two with outer tachometer ring, one a calendar with day and month windows and outer date ring, one a moonphase calendar with day and month windows with outer date ring; and an alarm waterproof with radium silvered dial, alarm hand, center seconds, 17 jewels, in a round case, steel or 10K gold-filled. * This information was supplied to me by the JSH and came from a book entitled "Swiss Timepiece Makers, 1775-1975" by Kathleen H. Pritchard.